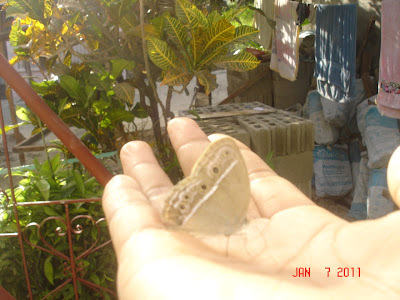 Filipinos believed in so many things including the visit of butterflies :-) I was in the bedroom when I noticed a brown butterfly which was cornered inside the house. I was amazed that even when I tried to help it out, it won't go away. What I did was, put the butterfly on the railings but, still, it just stood there. Filipino superstition, a brown butterfly would mean MONEY! If it lands on you, it brings goodluck!